What happens when life takes a turn? Do we run for the hills? Or take it for a wild ride? For our October show, themed “Collide,” six performers will share true stories about a time when they were thrown a curve and how it came to take them in a new direction. It’s like they always say, when the going gets tough, the tough write a triumphant story and share it onstage! Join us for a sparkling story brunch guaranteed to elate and inspire. Tickets exclusively available here! John Hahm, Ellen Blum Barish, Hallie Palladino, Andrew Reilly, Marta Wilmes and Scott Woldman with music by James Neary. Tickets available at the City Winery site. 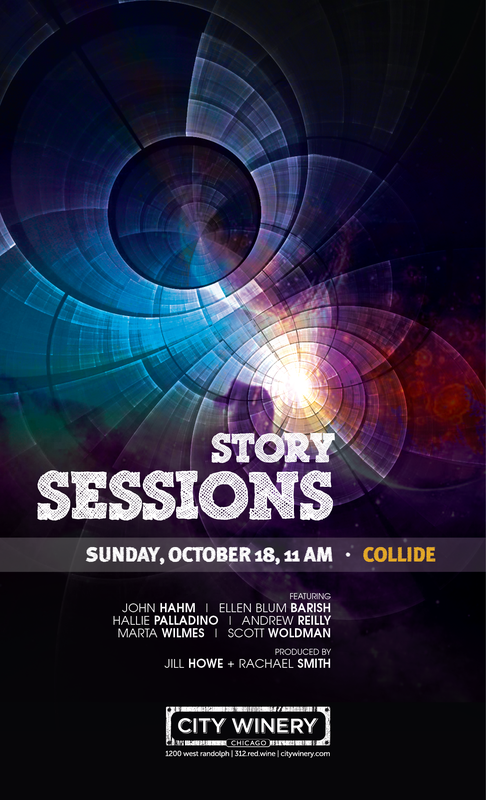 Story Sessions is a live-lit show, regularly at City Winery, with a wide range of performers. From storytellers to songbirds and writers to restaurateurs, each show takes a fresh look at a new theme through the lives of six featured tales. Each show begins with an hour of live music while the crowd gets settled in and enjoys a boozy brunch. While each story is told, our resident artist draws an illustration of it live. Throughout the show, hosts will collect “story notes” from the audience with short tales on the month’s theme and read them aloud. It’s a beautiful blend of art, music and the stories that connect us.